The trihydrogen cation, H3+, is the starting point for almost all molecules in the universe. Typically, H3+ is formed by collisions involving hydrogen gas, but its chemistry at the molecular level is relatively unknown. 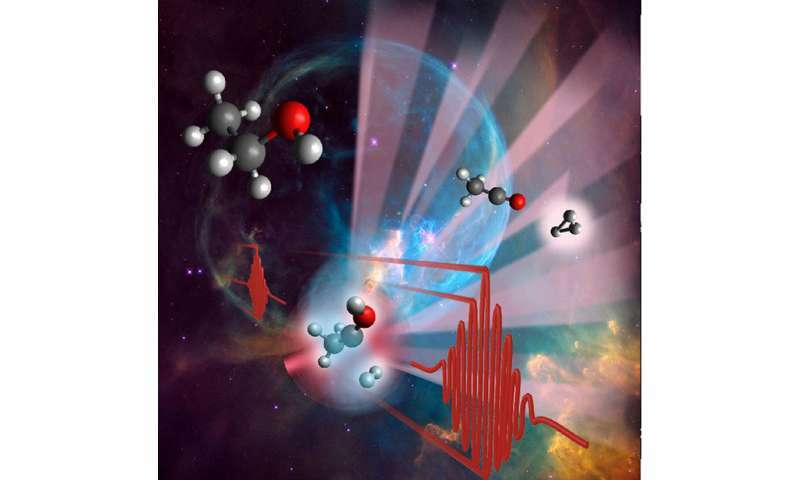 When organic molecules are hit by a laser pulse, they are ionized and the reaction begins. Then, the molecules break up into different fragments; one of which is H3+. They are able to measure the details of this reaction: the timescales, yield, and how chemical bonds are broken and formed. These experiments also give key details about each step of the reaction which occurs on ultrashort (faster than one millionth of a millionth of a second) timescales. The findings are important for astrochemistry because organic molecules, including alcohols, are present in space. This is one step further into learning how organic molecules form and behave in the universe. Also, the fact that forming H3+ involves a neutral hydrogen molecule that roams and takes away another hydrogen atom is significant. Why? Roaming chemistry is a new and relatively unknown phenomenon; this work offers insight into this type of chemical process. Scientists have figured out additional ways that the trihydrogen cation, H3+, the most abundant ion in the universe, is produced following high-energy activation of alcohols and other organic molecules. Despite the strong repulsion between charged particles, the team found that a roaming hydrogen molecule was responsible for the chemical reaction producing H3+. The researchers conducted the study using intense femtosecond laser pulses and instrumentation able to detect the resulting ions from experimental measurements. The reaction happens in either 100 or 340 quadrillionths of a second depending on the starting molecule. They confirmed the mechanisms by using quantum mechanical calculations and by ion-ion coincidence measurements. The research findings are important for astrochemistry and for understanding how organic molecules form and behave in the universe. Furthermore, these findings are relevant when intense lasers are used for surgical procedures.